Basic ingredients: Run out of the Marylebone kitchens of the husband and wife team from Return to Tuscany TV fame, this is the only Italian cookery school in central London. Katie and Giancarlo (he loved her painting, she loved his pasta – they now have two restaurants, a cookery school and two sons…) offer a range of courses from Cook for kids like a Mama to how to deliver a Mediterranean dinner party, or perfect you risotto and cannelloni making skills. Daytime, evening or weekend hands-on courses (£90-£125) are the mainstay but there is also a seven-week course for the more committed (£600). The family home in Gerrard’s Cross also hosts courses, plus the highly rated Bray restaurant in Berkshire. They say: Our school is a place to get your hands dirty and celebrate dishes from every Italian region. We Say: This is one of the best places to go in London if you want to learn to cook like the Italians. 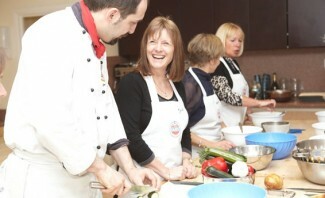 Watch out for courses run by the Caldesi’s team of top guest chefs, from Richard Bertinet to Sophie Grigson.